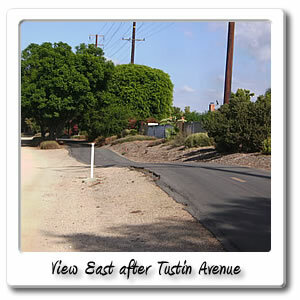 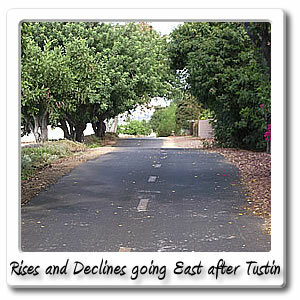 Welcome to Tustin Avenue on the Santa Ana River bicycle trail. 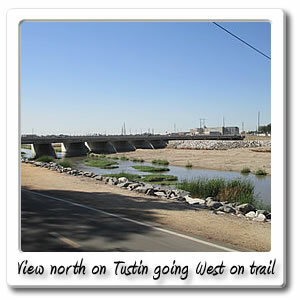 Shortly after mile marker 17 will be the Tustin Avenue entry point about 17.5 miles, 1 hour and 28 minutes from the Santa Ana River Trail. 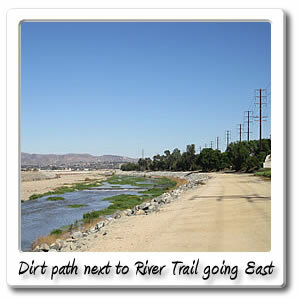 You will also be 58 minutes and 11.3 miles from the Green River Road entry point and the end of the Orange County section of the Santa Ana River Trail. 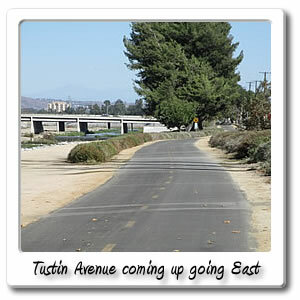 Getting off at Tustin Avenue in the City of Anaheim, and going south will take you to Lincoln Avenue 1 mile and 8 minutes after going up a steep hill. 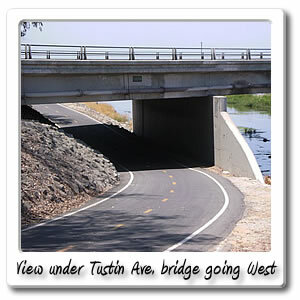 On side of the corner you will find a Vons grocery store and a US Bank inside of it, Burger King and Bank of American. 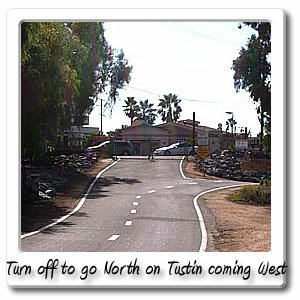 Theres a Del Taco at the other end of the parking lot and other shops. 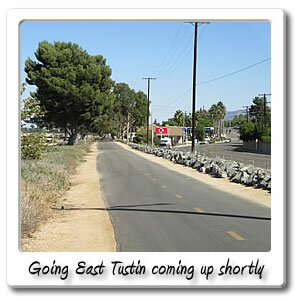 If you continue south on Tustin Street in the City of Orange you will find another Del Taco, In-N-Burger and Chick-fil A. 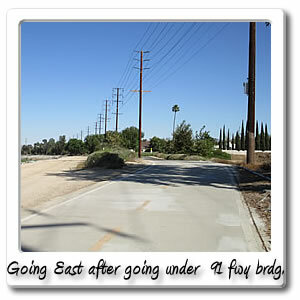 If you keep going south you will find a Mc Donalds also. 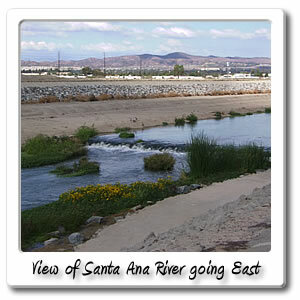 The Village of Orange can be found 1.4 miles and 10 minutes after getting off the Santa Ana River Trail. 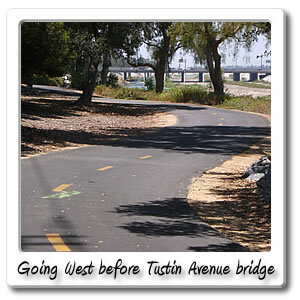 Getting off the Santa Ana River Trail at Tustin Avenue in the City of Anaheim and going north for .5 miles and 3 minutes before you get to La Palma Avenue, there will be a Taco Bell, Carl's Jr. and other stores in the Pacific Center over on your left side. 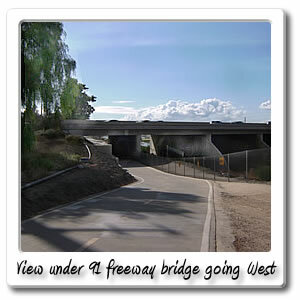 Going to the other side of the parking lot will take you to the Metrolink Station from there, you can go to Corona/ Riverside/ San Bernardino, Los Angeles, and other points west and north from there. 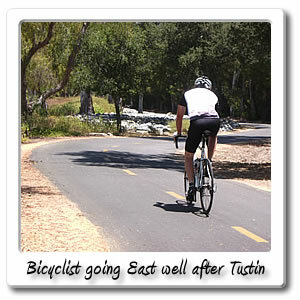 You can also go to the City of Orange, and over to Irvine and then to the more southern beaches in Orange County, before ending in the City of Oceanside in San Diego County.